Cash Balance plans are the fastest-growing sector of the retirement plan market for a very good reason. Think of these plans as a retirement savings accelerator, doubling or tripling your tax-deferred savings power. Now Kravitz has made Cash Balance plans an even better solution by introducing an innovative new option: flexible investment choices within a single company plan. At Kravitz, we start by helping our clients choose an appropriate Interest Crediting Rate (ICR) and then we work closely with the client and their plan’s investment advisor to find the right Cash Balance investment strategy for the chosen ICR. Depending on the client’s business objectives, number of participants, contribution amounts and other variables, the right ICR could be one the IRS Safe Harbor options or ‘Actual Rate of Return’ with or without multiple investment options. We have provided an overview below to help you understand ICR options and different approaches to investing plan assets. Thanks to IRS regulations introduced in 2010, plan sponsors can set the ICR to equal the “Actual Rate of Return,” or yield, on plan assets. Rather than striving each year to ensure that investments achieve a targeted interest rate, the actual return itself is the ICR. Th is option can substantially reduce investment risk and allow for more predictable annual contributions. Prior to the 2010 regulations, plan sponsors using safe harbor rates faced challenges if the investment returns either fell short or exceeded the targeted ICR. Additional contributions were required in the case of underfunding, and if returns were too high, contributions tended to be lower due to the surplus of assets. In this case, the tax deduction could be lower and contributions were less consistent. 30-year Treasury rate: accounts annually receive a credit equal to the yield on the 30-year U.S. Treasury bond, which has averaged 3% to 4% in recent years. Fixed rates: the IRS allows plan sponsors to choose a fi xed rate up to 6% as the ICR. Combined rates: an annual fl oor of up to 5% with any safe harbor rate. 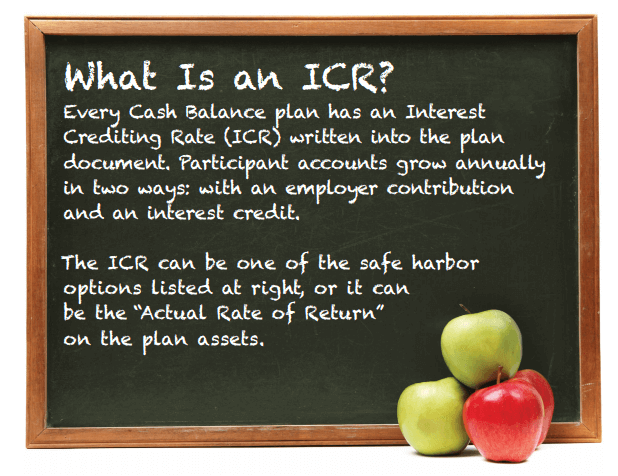 For example, a plan sponsor could choose an ICR equal to the greater of the 30-year Treasury rate or 5%. What are the Advantages of an Actual Rate of Return ICR? 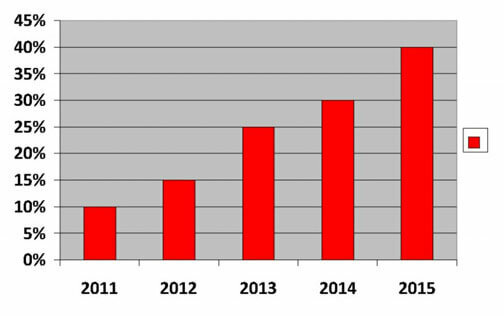 In 2015, more than 40% of Kravitz Cash Balance plan sponsors with large plans (100+ participants) now use an Actual Rate of Return ICR, up from 2% when the regulations were issued. We expect that the new investment choice options will make Actual Rate of Return even more popular. New regulations introduced in 2014 created an exciting new investment approach for plan sponsors. You can now offer multiple investment options within a single plan, tailored to suit different retirement goals and needs.